In this concise article we discuss many proven home remedies that will get rid of painful canker sores, and you won’t have to worry about the side effects and various other problems that may arise due to the use of other drugs people blindly use for the condition. Canker sores are painful ulcers that occur in various areas of the mouth such as gums, throat, cheek, lips and tongue and people who suffer from them are always on the lookout for effective treatment methods. 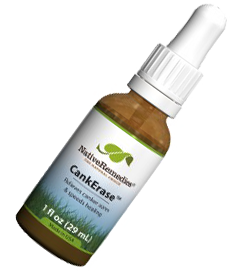 In most of the cases, canker sores tend to heal up on their own, however using a natural treatment method as a canker sore remedy can really speed up the healing and can reduce the pain without harmful side effects. That’s what those who are blessed with wisdom always seem to say. And while this might be an appropriate goal for your life overall, it’s not necessarily helpful for the small-yet-annoying day-to-day problems you have to endure. Like spilling hot coffee on a shirt, or being unable to find your car keys when you’re late for work… or dealing with canker sores. Canker sores are not fever blisters or cold sores, but rather small lesions and unlike cold sores they are not caused by a particular virus. They are between a quarter inch and an inch in diameter and can be found on the tongue, lips, mouth, throat, or cheeks. Though canker sores tend to be genetic and found in teens or young adults, stress, poor diet, mouth injuries, and a weakened immune system are thought to be correlating factors. Canker sores usually heal on their own within a week or two, when they burst open and then appear yellow or white in color with a red border. Help! I’ve Got A Canker Sore! The pain and discomfort of canker sores may make you want to jump in your car and drive to the nearest dentist for relief. If you have the time in your schedule, this may be the simplest way to address the problem. A dentist or dental assistant may have suggestions or medicines that can provide you with fast, effective relief for your canker sores. Baking soda. Many people seem to think that rinsing with baking soda and water four to five times a day is even more effective than basic salt water rinses. Another idea is to use less water and make a baking soda paste which can be rubbed on the canker sore. Salt and hydrogen peroxide can even be added to this mixture for additional pain relief. Salt Water Or Salt: Salt water or salt is the most simple yet probably the most effective canker sore treatment out there, as it really eliminates the sores. Just mix 1 teaspoon of salt with a bit of water, then gargle for about 30 seconds. If you want your canker sores to disappear faster, you could just directly place salt onto the sore. Just dip a q-tip under water, then sprinkle some salt on the tips, and then place the edges of the q-tip on your sores for about 30 seconds. Milk of magnesia. While generally used as a laxative, dabbing a bit3 of milk of magnesia on a canker sore a few times daily can help form a protective coating around it. The substance also has antibacterial effects to keep the canker sore from getting worse. Swishing with milk of magnesia can have the same effect. A wet tea bag. How does this help? Tea contains tannic acid, which acts as an astringent to speed the healing process while decreasing inflammation and pain. For best results, use a black or green tea bag, wet it with cold water, and press it on the canker sore for several minutes. Sage. This herb has been used for its medicinal properties for centuries. Brewing sage leaves into a tea, allowing it to cool, and rinsing with it can often provide instant pain relief in canker sore sufferers. This treatment is recommended several times a day for three to four days. Cayenne pepper. This may sound counter-intuitive, but cayenne pepper contains a substance called capsaicin, which has the ability to numb nerve endings that cause the pain associated with canker sores. So rubbing a pinch of cayenne pepper on your canker sore can help (though it may sting at first). Plum juice. Health food stores and even mass market retailers now sell plum juice, which not only contains vitamins and nutrients but can also aid in reducing canker sore discomfort. Either use plum juice as a mouthwash or dab some on a cotton ball and apply it to the canker sore for ten minutes or so. Onion. If you’ve ever cried while slicing onions, you know that this vegetable packs a punch. Pressing a chunk of raw onion to your canker sore for several minutes can allow the onion’s juices to begin attacking the canker sore and reducing inflammation. Increased intake of vitamin B12 – Many people experience recurring canker sores in mouth have deficiency of vitamin B12. This vitamin is also known as cobalamin and is soluble in water. It not only helps in reserving the nerve cells, but also helps in creating DNA and RNA. Aside from that, they help in the proper utilization of iron in your body and help in the creation of red blood cells, and also help the body in handling stress with much vigor. Few symptoms of vitamin B12 deficiency are diarrhea, numbness sensation in finger and toes, shortness of breath, nervousness and diarrhea. You can treat canker sores in tongue and other areas of your mouth by milk, chicken, fish, eggs and other foods derived from animals. Aside from that, there are many fortified food items such as cereals that can be taken by vegetarians to prevent B12 deficiency. Vegetarians are more susceptible to vitamin B12 deficiency and they should take more care of their diet. If you love seafood, you can take mollusks and clams as they are rich in vitamin B12. Some seaweeds such as nori have significant amount of vitamin B12 in them and are an excellent source for ridding your mouth of canker sores. Vitamin E: Vitamin E is also a great remedy for getting rid of canker sores, because it has the capability to eliminate the bacteria inside of the sores. All you need to do is prick open one vitamin E, and then directly rub it on your canker sores. The main reason why this vitamin gets rid of canker sores is because it’s a natural antioxidant that heals the lesion. 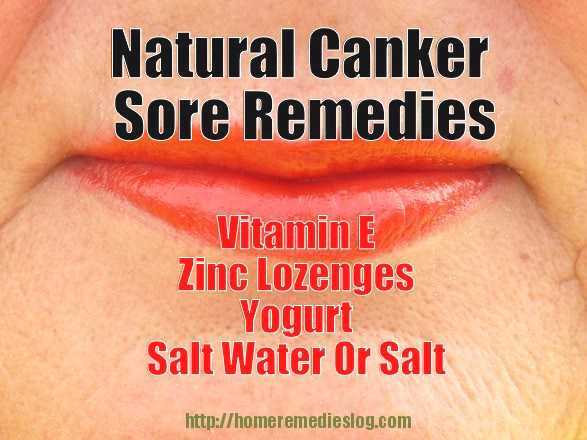 Repeat this remedy about once a day, and in a couple of days, your canker sores will completely vanish. Vitamin Supplements – You should take vitamin supplements for Folic acid, B1, B2, iron and B6. Not only are the B vitamins good for canker sores, they are beneficial for many other areas of health too. Take it easy – In some cases, physical trauma is also a trigger for canker sores. Playing sport, brushing too hard or accidentally biting cheeks while chewing can cause canker sores. You should regularly brush your teeth in a proper way, and do flossing. By removing any foreign debris, you can eliminate any chances of canker sores before they actually start. This is a tremendously easy home remedy but it is easy to take it for granted… so don’t!. German Chamomile – This is one of the best treatments for canker sores that has been used for centuries. Chamomile is also used as a remedy for sore throats, ulcerative colitis, gingivitis, irritable bowel syndrome, colds, abscesses, eczema and psoriasis. It can provide you results within a week. Acidophilus Yoghurt – You should eat more yoghurt as it is not only a natural remedy for healing canker sores but is also great for neutralizing bad breath. Yogurt has active acidophilus culture that prevents and cures canker sores. If you frequently get these types of sores, then it is best to eat yoghurt in good quantities as it will prevent them from arising and would cure them in the affected persons. All you need to do is eat one to two cups of yogurt everyday, and in a few days, your canker sores will completely disappear. Yogurt can also heal open canker sores, so it’s a great remedy if you don’t want your sores to feel any pain. However, you should see your doctor, if your sores do not go even after 10 days of treatment, or you get such sores once or twice a month. Check your toothpaste – You should check if your toothpaste has sodium lauryl sulfate; (SLS). This chemical has been known as an irritant that can cause canker sores in your mouth. Lady’s Mantle – Also known as alchemilla vulgaris, it has been used as a remedy for mouth and throat infections, skin rashes, painful menstrual periods and various menopausal ailments. You can make a gel by crushing lady’s mantle in some glycerine and apply on your canker sores in mouth for quick relief. Eat healthy – Various snack foods such as pretzels, chocolates, soda pop, potato chips can trigger canker sores. More acidic foods such as lemons, pineapples, strawberries, and oranges can also contribute to canker sores. Every person has a different body, so the best way to keep track of the situation is be keeping a food journal and then compare the results with your canker outbreaks. Zinc Lozenges – Zinc Lozenges actually contain a high percentage of natural antibiotics, which means it eliminates the bacteria that caused your canker sores to appear. Though before you take these lozenges, make sure that you first get your doctors approval, as you could get an allergic reaction. Once your doctor allows you to take these lozenges, then don’t hesitate any longer to take them, as they are very effective at eliminating canker sores. Calendula Tea – If you frequently get canker sores, then you should rinse your mouth with calendula tea as it can help in curing canker sores in your mouth. You should take two tea bags and leave it in hot water for few minutes. Once the herbs go out into the liquid, you should use it as a mouth wash as it is more effective than chemical based mouthwash available on the market. Borax – Many experts advise that people with canker sores should take large dosages of homeopathic borax several times a day to get quick relief from pain. Many people also use aspirin, as it is quick and more effective. Ice – You should open your mouth several times a day to let air pass though it, as it can help in healing your aphthous ulcers. You can use ice cubes on the sores in your mouth to get relief from pain. You should also have foliate and iron minerals in the form of supplements, as their deficiency can lead to sores in your mouth among other things such as hair loss. One really good home remedy is to take a glass of water and dissolve a teaspoon of salt in it. Now rinse your mouth with this solution at least three times a day. Infuse a spoonful of tormentil root in half a glass of cold water and cover this vessel. Now boil the tincture for ten minutes on low fire. Decant it, and rinse your mouth with the decoction five times a day. Infuse one tablespoon of calendula blossoms in a glass of boiling water. Leave this tincture to brew for about an hour. Afterwards, decant it and rinse your mouth with it at least six times a day. Mix three drops of tea tree oil, three drops of lemon oil, three drops of myrrh essential oil and two tablespoons of grape essential oil. Smear your sores with this mixture every two hours. Mix four drops of geranium oil, four drops of tea tree oil, four drops of lavender oil in a glass of water and rinse your mouth with this mixture for about six times a day. This is one of the most effective canker sore remedies and it will show results within just a few hours. It’s not a bad idea to try these home remedies initially for your canker sores before seeking medical help. If these methods don’t do the trick, a topical medicine with active ingredients such as benzocaine (Anbesol), amlexanox (Aphthasol) and fluocinonide (Lidex, Vanos) to help ease the pain of canker sores. A doctor may also prescribe a mouth rinse containing the steroid dexamethasone to reduce pain and inflammation. Dealing with a canker sore can be exasperating and incredibly distracting despite its diminutive size. But you may have the solution to your problem somewhere in your pantry, cabinet, or refrigerator at home. Once your canker sores have disappeared, it’s advisable that you try to prevent them from coming back. Try to never use mouthwashes or toothpastes that have SLS in their ingredients, as they tend to cause canker sores. Make sure that you also don’t take any iron supplements, because it forms sores as well. Try to add a lot of dairy products into your diet since it does prevent you from getting canker sores. Make sure that you also don’t eat too much citrus fruits, because they can also cause the lesion. Consult your doctor so that you can gain more information on what you can do to eliminate and prevent canker sores from coming back. If your canker sores still haven’t disappeared after implementing thehome remedies above, then it’s advisable to seek your doctors assistance, as there may be an underlying health condition that needs attention. Watch this helpful home-made video featuring a girl who really knows how to eliminate a canker sore. 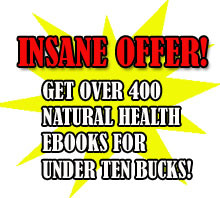 Get free home remedy ebooks delivered to your email every week simply by joining our newsletter!